Sonos speakers rarely go on sale these days, which is why Black Friday and Cyber Monday are such a big deal each year. They’re among a handful of opportunities to snag Sonos gear at discounted prices, and we highly recommend taking advantage of these rare opportunities. For Black Friday 2018, Sonos announced a handful of official Black Friday deals that went live last week, and the prices are good through the end of the day tomorrow on Cyber Monday 2018. These official deals include $25 off the Sonos One, $50 off the Sonos Beam sound bar, $100 off the Sonos SUB, and $100 off the Sonos Connect:Amp. Those are all terrific deals, but there’s something you need to know: Amazon has been running secret, unadvertised Sonos deals that on speakers that are more popular than any of the ones noted above. What’s more, the best-selling secret Sonos sale Amazon was running for Black Friday is even better for Cyber Monday! While supplies last, you can snag two Sonos Play:1 speakers for just $298, which is a $50 savings compared to buying them separately. But on top of that, you also get a $50 Amazon gift card for free with your purchase! Amazon’s Black Friday deal came with a $30 gift card, so this is a big perk for people who didn’t snag this sale during Black Friday. 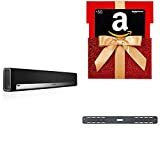 As for the other secret Sonos deal, it’s the same as it was last week: A Sonos Playbar sound bar for $699 with a free official Sonos wall mount and a $50 Amazon gift card.